Like a fantasy ending of a twisting, turning Bollywood movie, the spectacular wedding of an amazing couple and my dear friends, D & K., was truly worthy of a CD homage. Cheers to the start of the next phase of your Grihasthashram! 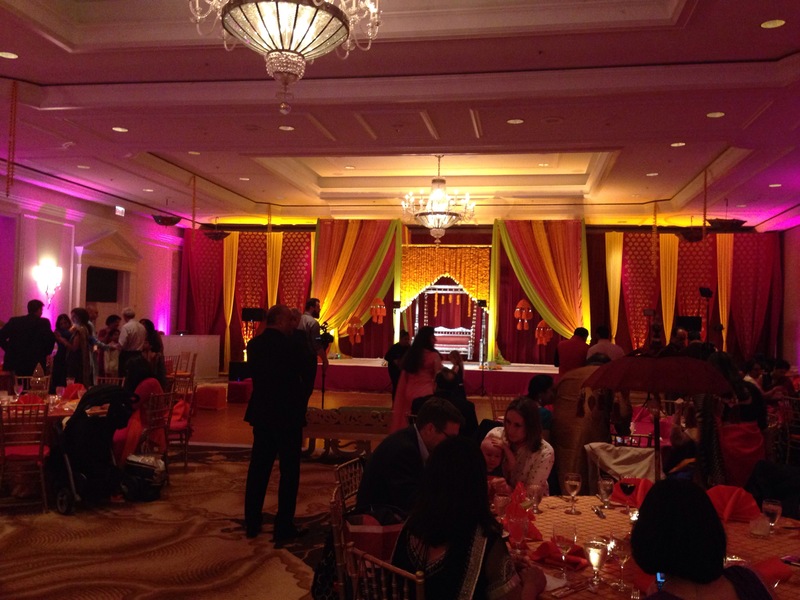 It’s been a long time coming, but I finally experienced one of India’s best cultural exports: The Indian wedding. If you’ve never experienced this fantastic cultural event, live vicariously here! Anyone involved in an Indian wedding will tell you it is an institution in and of itself. The very fact that it has been exported to essentially everywhere an Indian diaspora exists shows just how strong the Hindu cultural legacy has become, even as it is not as widespread or mainstream as Christianity or Islam. My dear friend, D, finally married the love of her life, K, after a long and storied journey that spanned two continents and navigated differences between American and Indian culture. I won’t embarrass D, who is American-born but of South Indian descent (the state of Karnataka, to be specific), with the details, but the story of her courtship by now-husband K, born and raised in Sindhi northern India, is indeed worthy of a Bollywood movie depiction. Their wedding was nothing less. 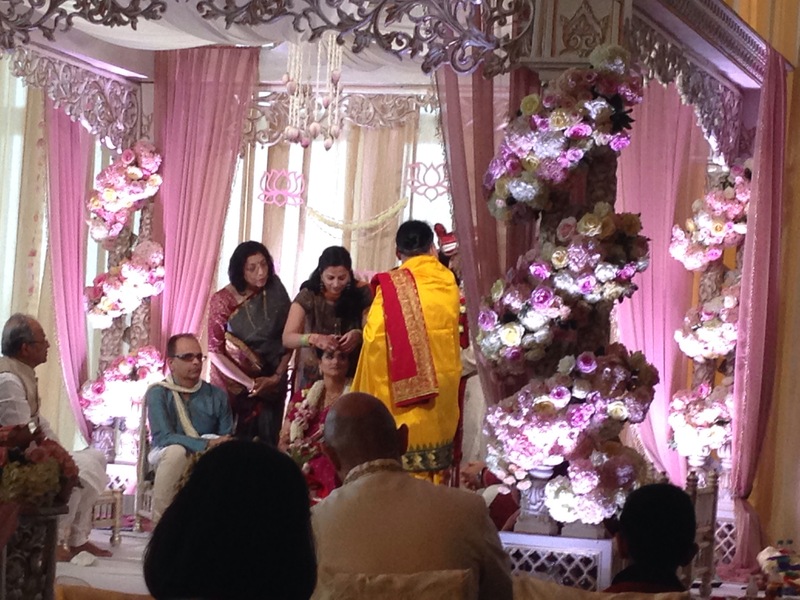 In Hindu tradition, every wedding decision requires the utmost care and deconfliction. The wedding date is chosen only after consulting a professional, who examines the betrothed’s birthdates and other factors to determine the most auspicious time to be wed. A (short) list of only the most compatible dates are provided, and of course, both families must be consulted. Once a date is chosen, planning can take place only during certain time periods. I bring up these points as context – my friends’ date was only settled 3-4 months before the wedding. That factor would pose a challenge to any engaged couple’s plans, but to plan an elaborate, two-day Indian wedding far exceeds the requirements of an average “Western” wedding. 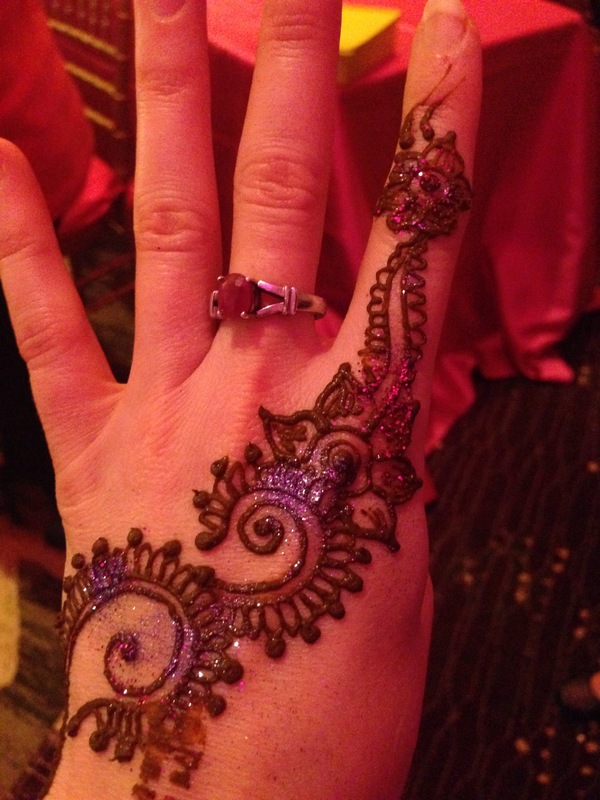 Our wedding events began with the Mehndi & Sangeet, the latter of which means “song” in Sanskrit (Hindi). 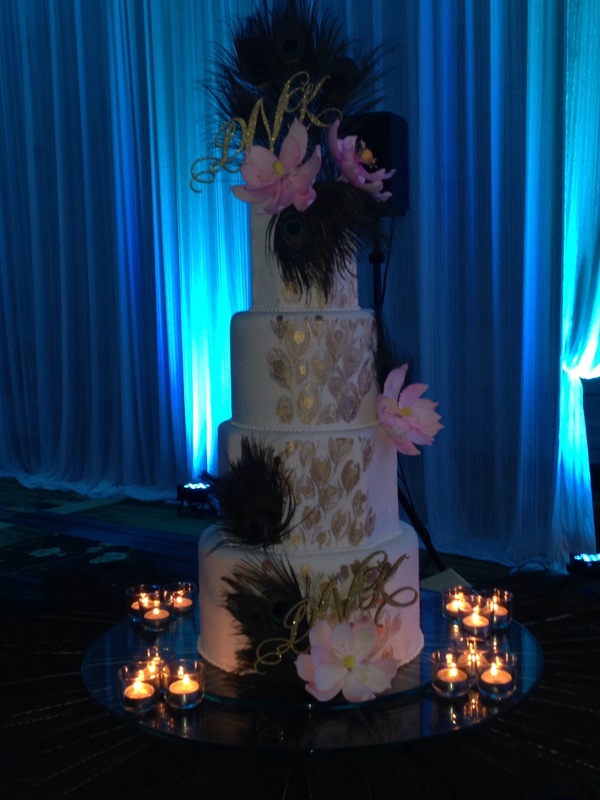 It was a night filled with dance and song, a celebration of the couple. And by that, I mean a series of dances and songs performed by the families and friends of the bride and groom. And by friends, I am including me. My very first (and possibly only if a video ever gets out!) Sangeet performances were, thankfully, as part of a group. The bride’s brother jokingly compared the series of performances to a track and field meet. It was an apt comparison! It was mildly mortifying and yet so much fun waiting our turn. There’s something about Indian pop that really energizes me – that and the great honor to be part of the celebration of an amazing couple. 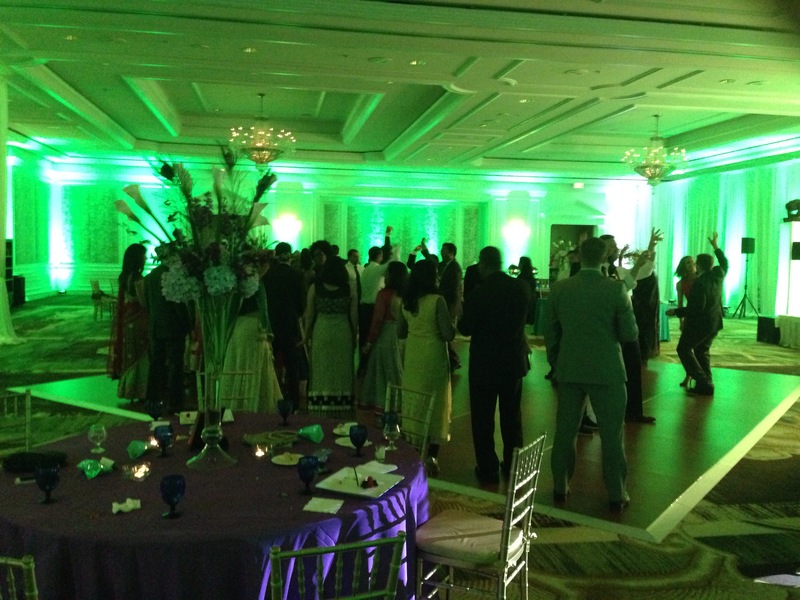 For the CD’s culinary tie-in, I have to talk about the Sangeet food. Southern Indian street food took center stage. Pani puri, bhel puri, and other light snacks were intensely flavored and served with contrasting spicy pickles and cooling chutneys. The caterer, Bollywood Bistro, rendered each of them deftly, making it easier to pig out, realizing only later just how many fried, carb-laden calories I’d consumed – my use of “light” as a descriptor was purely ironic. Which then made it all the more easy to just say heck with it all, why don’t I have dessert? 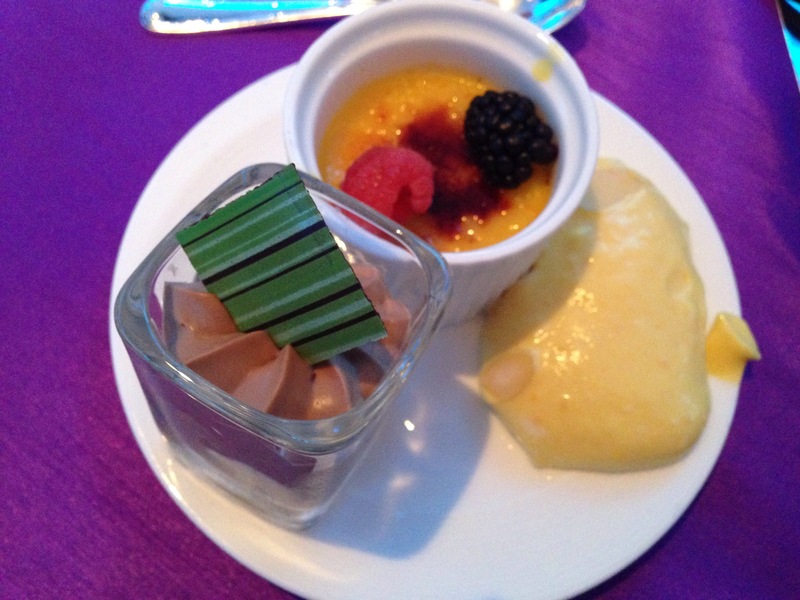 I enjoyed an unusually deconstructed, frozen version of my favorite vermicelli pudding. And then came an Indian after-meal digestive aid and mouth freshener, elaichi. Convinced to try it to help offset the heavy meal, I was unprepared for the resulting sensory assault. It tasted like someone dipped a bitter, thicker grape leaf with rose syrup and filled it with rose and clove potpourri. Chewing it, I smiled as I gagged inside, looking for a moment to dart to the restroom to get rid of it. I apologize to my Indian friends, but my tastebuds were nowhere near prepared for that sensation, and I highly doubt they ever will be. Washing one’s mouth with a bar of soap would be far more pleasant. My Indian friends: Please accept that I will politely decline it in the future! We awoke bright (ok not so bright) and early for the earliest wedding ceremony I’ve ever experienced – scheduled for 8:30 am (which is the far more manageable 5/6 pm in India). 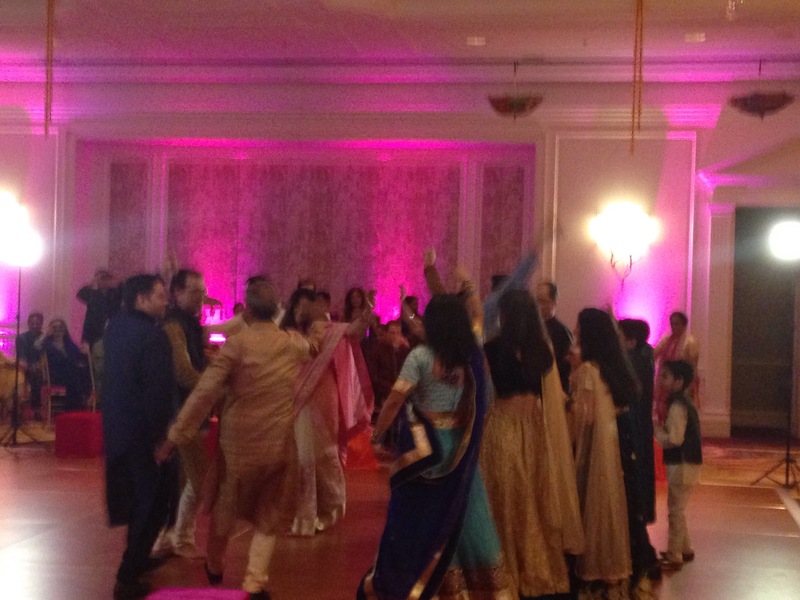 Indian wedding ceremonies are notoriously long. This three-hour one was no exception, but I observed (confirmed by Indian friends) that this one was not nearly as stuffy and formal as many ceremonies run. The priest and wedding party had a sense of humor! The ceremony began with a colorful procession capped off with the groom riding in on horseback. The venue was stunningly decorated in pastels enveloping the aisle and encircling a canopied mandap (westerners may think of it as a cross between a gazebo and stage). A series of ceremonies, overseen by a Vedic Hindi priest, essentially re-enact traditional rituals that signify the joining of two souls for the journey to family life, said to be the most difficult compromise and stage of life (you can say that again!). As I’m used to the standard American 20-30 minute ceremony, the Indian wedding program was lengthy, but it wasn’t quite so formal. It was amusing to see half of the guests at any given time on their mobile phones – and not just taking wedding photos, I might add. Bathroom and coffee/beverage breaks are acceptable and necessary. The post-ceremony lunch was a classy South Indian affair. South Indian cuisine = yellow dal (lentils), heavy spice, and, especially, fried carbs! But a lightly fried fritter served as an appetizer with coconut chutney was absolutely addictive. A mango lassi provided sweet relief for the heat in the food. 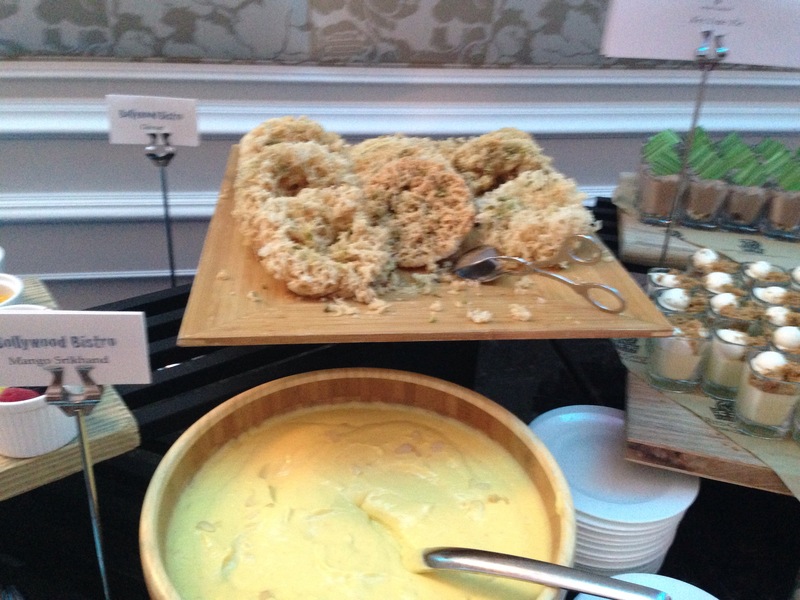 Once again, we did not leave an event hungry. The cocktail hour and reception resumed several hours later, which allowed the afternoon food coma to subside. 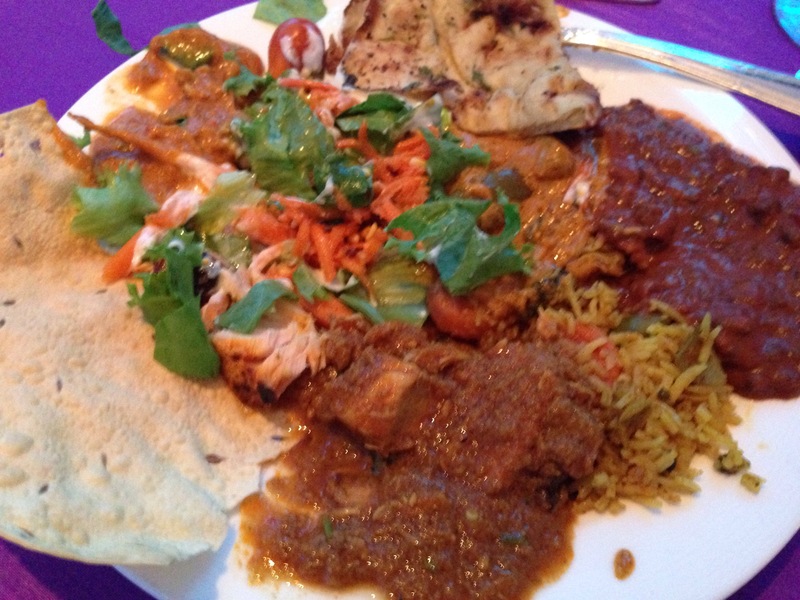 Thankfully, because the reception dinner eclipsed the previous meals and effectively set an impossibly high bar for any future wedding – Indian or wedding. The bride and groom spoiled their guests completely – from the delicate chicken tikka, vegetarian kofta, and paneer pakora (fried cheese!) served as appetizers to the full North Indian buffet, complete with chicken and fish curries, vegetarian korma and dal makhani, and vegetable biryani. I was painfully full then, and a moment of panic set in when I saw the dessert table, beautifully packed with a mix of both Indian and western sweets, including a wonderful, thick Srikhabd, a mousse-like mango pudding, and Gheear, a Sindhi pastry (sort of like a hybrid of a Rice Krispie treat and a doughnut, but slightly less sweet). 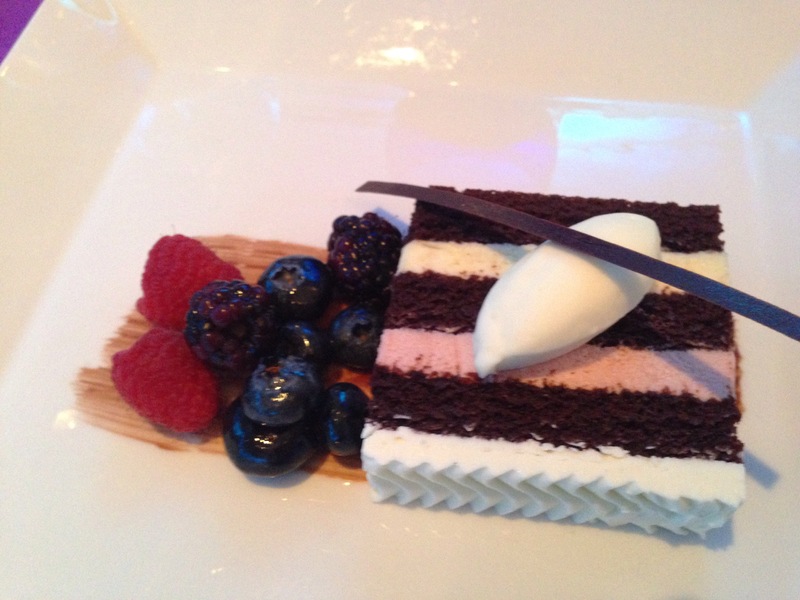 I was told the caterer flew in this pastry the night before – all the way from India, as it is rarely made in the US. Lest that be the happy ending to my culinary journey through an Indian wedding, the sweet train did not end before a slice of beautiful, western wedding cake. 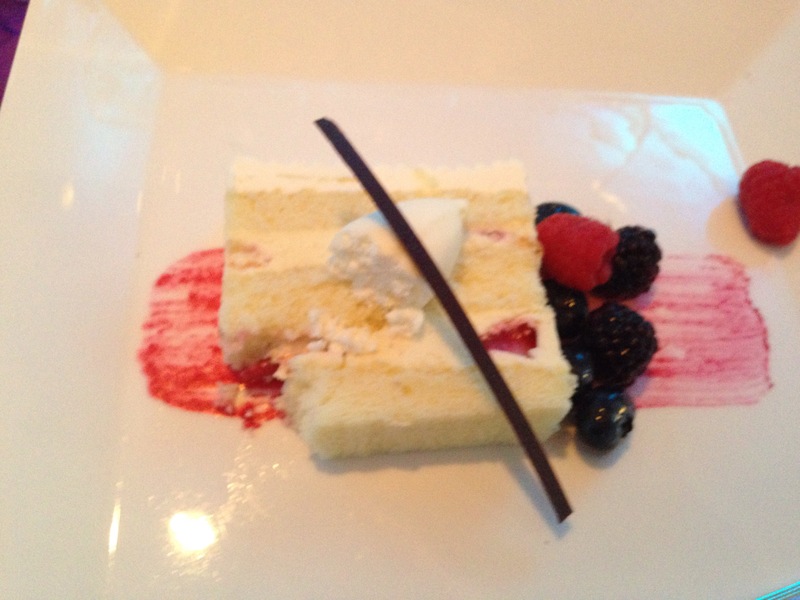 Light as air with a hint of white chocolate and strawberry, the CD absolutely approved! 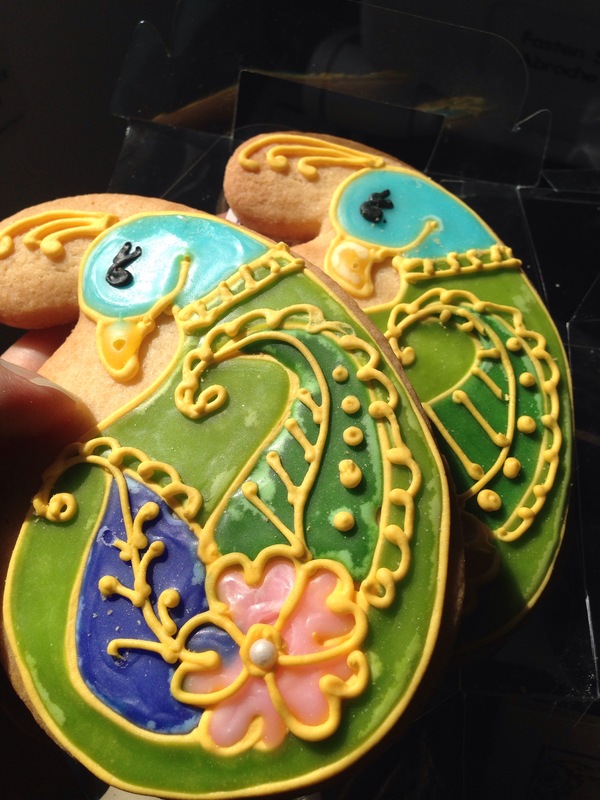 The food didn’t end there – as the couple made sure to send guest home from each event with a goodie – from these beautifully decorated peacock sugar cookies to cupcakes and more traditional Indian pastries. With all this food, I can see why dancing is such a crucial part of any Indian wedding – how else can one burn off those calories? The newlyweds spared no detail or thoughtful touch to this exquisite event, including wonderful cookies, Indian sweets, and a cupcake sent home with us. It was an unforgettable weekend of happy celebrations, cultural experiences – and yes, more than enough food. Time for a workout! Hahaha, well written, especially the part related to the mad dash to the BR (I was in tears reading it), BTW, I stayed clear from the elaichi, however found it entertaining watching others’ responses 😉 No doubt that if you wanted to eat well and dance to some good music that was the place to be. Well written for the newly initiated.